Poor Cushioning or Less Cushioning is the things of the past, now Yonex Brings a Comfort Cushioning with proper ventilation to the foot of all badminton players. Yonex new model Latest SRCR Aero Comfort Cushioning comes with a Double Russel Mesh, TruShape, TruCushion, Dual Density Phylon Midsole, Carbon sheet, Hexagrip, and Round Sole. Yonex comes out with Yonex Aero Comfort Cushioning Badminton shoes to a better stability on landings for quicker, sharper movements. Double Russel Mesh - Highly Breathable open mesh is lightweight and durable. TruShape - Removes Pressure and provides a comfortable fit around toes. Centre of gravity shifted to the large toe when most power is concentrated for a painless fit that offers more speed in your step. 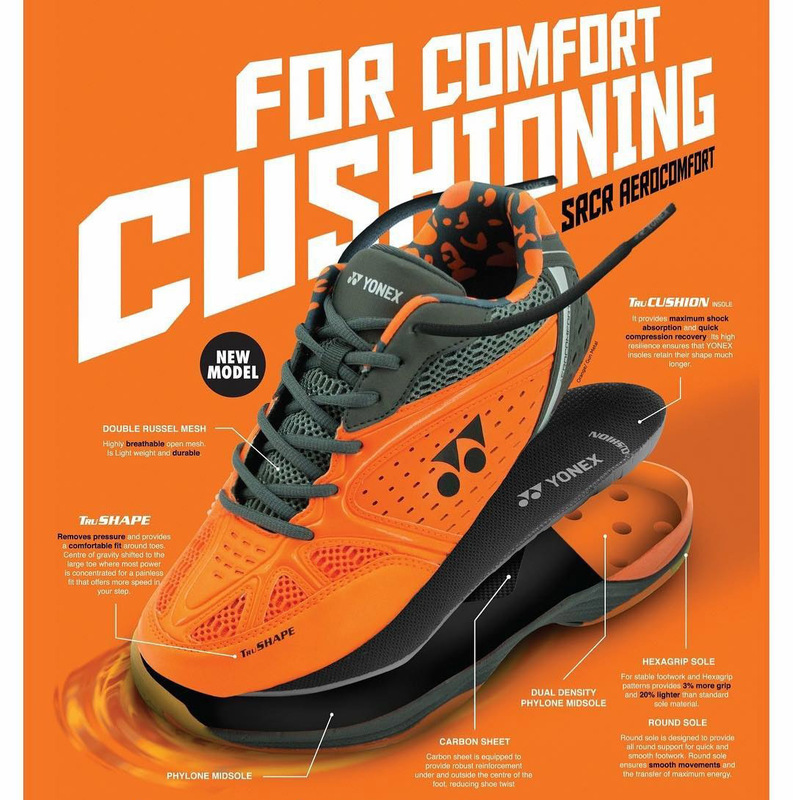 TruCushion - It provides maximum shock absorption and quick compression recovery. Its high resilience ensures that Yonex insoles retain their shape much longer. Carbon Sheet - Carbon Sheet is equipped to provide robust reinforcement under and outside the center of the foot, reducing shoe twist. Round Sole - Round Sole is designed to provide all-around support for quick and smooth footwork. Round Sole ensures smooth movements and the transfer of maximum energy. Hexagrip Sole - For Stable footwork and Hexagrip patterns provides 3% more grip and 20% lighter than standard sole material. The YONEX Tru Cushion absorbs shock then reverses the impact energy for smooth transfer into the next movement. If you are looking for an old version of srcp comfort badminton shoes then you can buy from here.